Shots erupted in a packed Seattle-area shopping mall Saturday after an apparent argument between a gunman and two other young men, killing one of the men, creating panic among shoppers and sending police on a store-to-store search for the shooter, authorities said. The Southcenter Mall in Tukwila was locked down for six hours as police tried in vain to find the gunman. Officer Mike Murphy, a police spokesman, told The Associated Press there were "thousands" of shoppers at the mall when the shooting took place just before 3:45 p.m. He said the gunfire may have been gang-related. "It's a possibility," Murphy said. 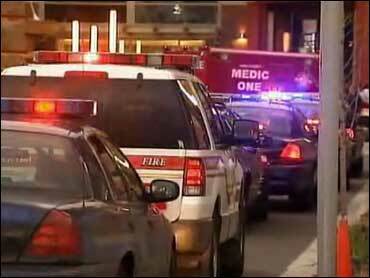 The two injured men were taken to Seattle's Harborview Medical Center, where one of them died. A hospital spokesman said Saturday night the second victim was in critical condition. The gunman used a pistol and fired multiple shots, Murphy said. The gunman and the two victims were all in their late teens or early 20s. No one else was injured, Murphy said. SWAT teams from all over the area converged on the mall to help search for the suspect, who is believed to have gotten into an altercation with the two victims. But it was unknown what led to the shooting or the relationship between the shooter and the victims or even between the victims themselves. He said at least four or five people were detained for questioning, but none of them was the shooter and some had been released. He said some of those detained were witnesses. As police searched for the gunman, they allowed store employees and customers remaining in the mall to exit in groups, Murphy said. After the search was completed, Murphy said the assailant "must have got out with the crowd," but police anticipated identifying the shooter "soon" and making an arrest. Chauncey Williams, a soldier from Fort Lewis, said he witnessed the shooting. He was exiting a store when he saw two men arguing and one start firing a gun, he said. "It's like I'm back in Iraq or something," Williams told The Seattle Times. Eyewitness Melissa Del Toro told CBS Affiliate KIRO that as she was coming from the movie theater towards the food court, "We saw a wave of people coming at us from the center of the mall, sort of like a big giant wave of people screaming." Toro said she didn't realize what was going on, but knew she had to get out. Toro said she ran to a bathroom and gathered in a handicapped stall with about eight adults and two children. She said everyone was huddled in the stall and they were trying to calm the children who were screaming. Toro said they spent several minutes in the stall before leaving the bathroom. Jeanette Warren, from KIRO News Radio, said she was shopping when she heard one noise followed by two more gun shots and then was ushered to the back of a store. "We laid low probably for one minute and were very quiet as we listened for voices telling us it was OK," Warren said. She was then escorted out the back door by a store manager into the parking lot. Warren said people were definitely fearful, especially among the younger people who were separated from their parents or relatives. Jessie Vanderschauw told KIRO she was shopping inside the Forever 21 store when she heard the gunshots. "Heard two or three gunshots. It was just 'pop, pop.' Everyone knelt down and hid behind whatever they could. You could see people frantic," she said. She said employees had shoppers go into the dressing rooms for about 30 minutes before escorting them out. Shopper Mark Nickels, 51, described the chaos after the shooting. "Everybody just stopped," he said. "Everybody thought something fell. Then a second or two later, there was a second shot and then everybody scattered. People were running to the (exits) or running to the stores to hide." The mall will be open regular hours on Sunday from 11 a.m. to 7 p.m.